For more than 16 years, Sunstar Houseboats has been manufacturing houseboats for clients across the United States. With top-quality craftsmanship, attention to detail and dedicated customer service, Sunstar Housebaots has manufactured more than 275 houseboats over the year and we proudly continue to make houseboat dreams come true. With more than 100 years of combined experience in houseboat manufacturing, the owners and staff at Sunstar Houseboats are committed to making your houseboat dream a reality! 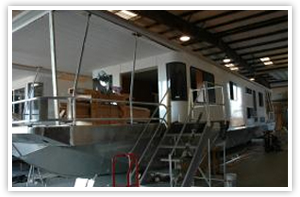 Custom houseboat manufacturing is the anchor of Sunstar. We build each houseboat like it was our own. We have recently expanded out services to better accommodate the needs of our clients across the market. 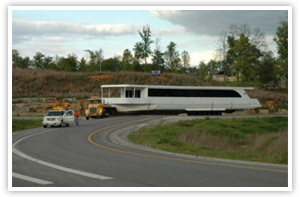 Recently, we branched out to include houseboat transport as one of our services. Should you need a houseboat or other large boat moved from one location to another, Sunstar Houseboats is here to help you. We have an extemely experienced team of movers, are fully insured and have the capability to move your houseboat to any location in the country. Sunstar Houseboats is also now a used houseboat brokerage, with several late model houseboats for sale, including a 2011 River Yacht, perfect for making the trip around the Great Loop! Please check out our For Sale link to see just what we have to offer! If you want to purchase a houseboat, or are in the market to sell your houseboat, we here at Sunstar are ready to assist you. We provide extensive pictures and details about each boat, so whether you are buying or selling, we can help you with all your needs. Sunstar Houseboats is also a supplier of houseboat parts and accessories. Let Sunstar Houseboats help you find virtually any part that you may need for your houseboat. Looking for new deck furniture or to update the fabrics throughout your houseboat? We have an extensive samples room that includes fabrics, carpets, granite, tile and other samples so you can put the finishing touches on your houseboat. Want to find new deck furniture, or get additional pieces to match your current style? Sunstar Houseboats can help you find exactly what you are looking for. In addition we can also help you repair or replace your canvas. Regardless of the part or accessory you are looking for, Sunstar can help! Houseboat maintenance is yet another service offered by Sunstar Houseboats. Whether you want to dry dock your houseboat for an overhaul or you want us to come to you to service your boat, we can accommodate your needs. We can service your engine, replace parts, or provide general maintenance in house or at your dock. Sunstar Houseboats really is a one-stop shop for all your houseboat needs. From top to bottom, from inside to outside, Sunstar Houseboats is here to help you enjoy the houseboat of your dreams!